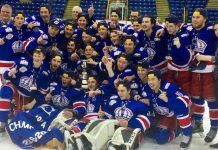 The 2017 BC Ford Dealers Road to the Fred Page Cup BCHL Playoffs featured some of the best hockey and top moments of any recent postseason. And the league’s attendance figures show fans got caught up in the excitement. Playoff-bound BCHL teams combined to attract 138,852 fans over the course of 73 playoff games for an average of 1,902 per game. That is an increase of 23.7 per cent from last season, when just 60 playoff games took place. From the middle of the second round onwards, there were only two crowds that did not reach four figures in size and both those games were within a few bodies of reaching that mark. The largest crowd of the entire postseason came opening night in Round 1 in Wenatchee as 4,300 fans saw the Wild defeat the Prince George Spruce Kings 4-1 on March 4. There were 15 crowds of 3,000 fans or more, and seven of 3,500 or more. Even in some of the league’s smaller buildings, record crowds came to see the BCHL playoffs. The Merritt Centennials drew a season-high 1,080 fans for a March 24 game against Penticton and the Powell River Kings drew a season-high 1,461 in a March 25 game against Victoria. With the BCHL playoffs now complete, the spotlight rests squarely on Penticton where the Fred Page Cup champion Vees host the Western Canada Cup (WCC) presented by Sun Life Financial. The event sees champions from the four Western CJHL leagues come to the South Okanagan Events Centre (SOEC) to determine two teams to go to the RBC Cup national championship in Cobourg, Ont. The WCC runs April 29 to May 7 at the SOEC.